I’ve planted my tomatoes and I’m going to plant some more! How about you? Did you get any veggies into the ground this Memorial Day weekend? There were nice days and rainy days and so many activities pulling us in every direction. I devoted four hours on Sunday to planting. It felt good, but it still seemed a bit cool for these warm loving crops. Not to worry- we are completely stocked with tons of of organic vegetable plants. If you didn’t get around to planting, or, like me, you are STILL planting, Natureworks is your happy place. Boy oh boy do we have beautiful basil! 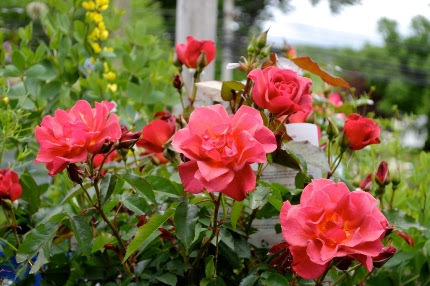 We have the best selection of roses including ‘Cinco de Mayo’, one of my favorites. What an unusual color. by Memorial Day had to do with the fact that many plants would be too far along in their growth cycle to be dug up in June. BUT, we are in a totally different world now. Most plants are produced in pots. They move easily from grower to garden center to your garden. Planting continues full force in June and beyond. All of my crews basically leave Natureworks every morning with plants to be installed all summer long. So, if you didn’t get it all done last weekend, just KEEP ON PLANTING. 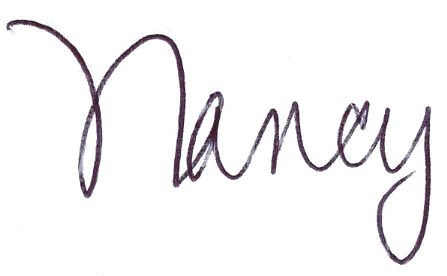 Let that be your mantra. Along with the standard fare, I am trying some new crops this year and you should too. 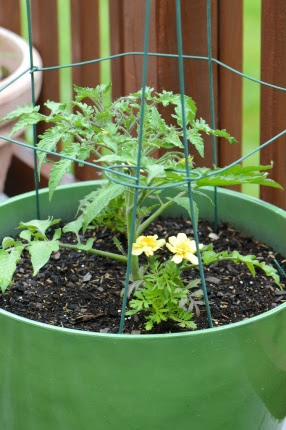 I have added two dwarf tomatoes to a new planting area in front of my sunny back garage. They are planted in an old wheelbarrow! Dwarf tomatoes only get 3-4′ tall and are bred to have that rich heirloom flavor on compact plants. I planted a few hills of ‘Honey Butternut’ baby butternut squash. Next I am adding Syrian pumpkins that have seeds with no hulls. We LOVE pumpkin seeds in our house and this makes it so much easier. I also planted Tulsi or sacred basil. A client gave me a cup of Tulsi Tea this winter when I had a cold and I fell in love with it. 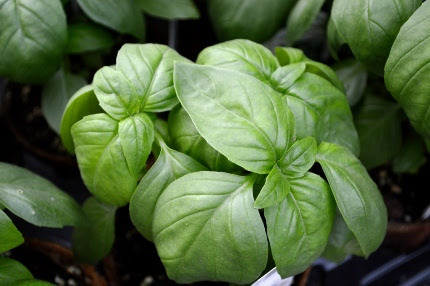 This is the sacred basil of India, used for medicinal purposes. I love the fragrance and the flowers. I am actually planting it in a container of hummingbird-attracting annuals. Hummingbird Flowers in June. At 6:00 we will have a Vegetable Potting Party. I will demonstrate all different ways to plant edibles into containers- pots, old wagons, crates, hanging baskets, windowboxes, pretty much anything that holds soil. I want to inspire you to get super creative this year and really up the number of edibles you grow, no matter what size yard you have and especially if you don’t really have a dedicated veggie garden. New to our educational lineup is a workshop that we are offering 4 times- this Saturday and Sunday AND next Saturday and Sunday: 3 Dimensional Planting with Smart Pots. You will be guided by Jillian on Saturday and Kassie on Sunday to plant up your own Smart Pot. This is a hands-on workshop and it will be lots of fun. So check out the details below and register yourself and a friend. Grow food organically and you will know what you are eating. Plus, you will get the thrill that all of us at Natureworks understand-going outside and eating from your yard is so rewarding. Grow your own food! 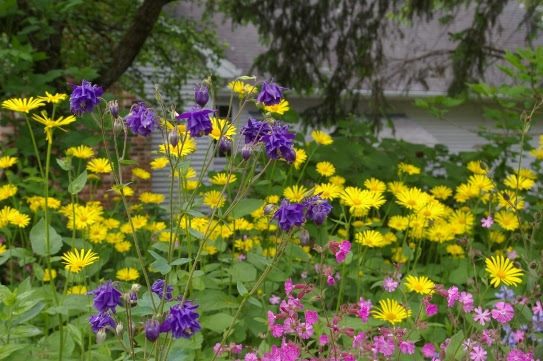 As we segue from May into June, the classic, old fashioned flowers are coming into their own. It is interesting to work with a staff of younger folks who are just, finally, beginning to understand the value of the classics in garden design. 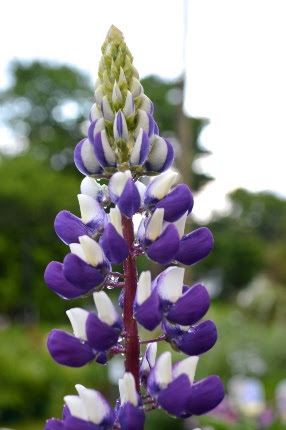 Lupines are on sale for the next two weeks. 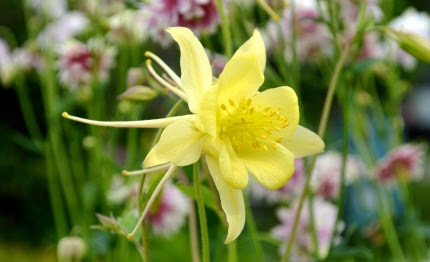 foxgloves and columbines move around, seeding into beds where they have never been before. They teach us that the garden sometimes has a mind of its own and the combinations that appear are often way more interesting than what we could dream up. Mock orange (Philadelphus) is just so fragrant and pure white. 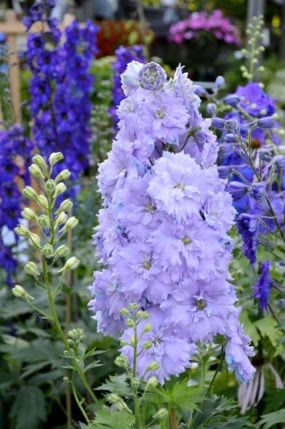 I have one in one of my backyard borders and, as it blooms, I make sure I walk down there and inhale its intoxicating perfume every evening. It is basically a carefree plant; a little pruning in June is all I ever do to keep it happy. When I was in England last year, mock oranges were everywhere, a part of so many borders. The fragrance speaks of England to me. right now. After they finish flowering, it is so tempting to leave the seed pods up as they are so architectural. Don’t do it. As these flowers go to seed, they steal a lot of energy from the bulb, which is busy underground building up a store of energy to form next year’s flower buds before the bulb goes completely dormant. 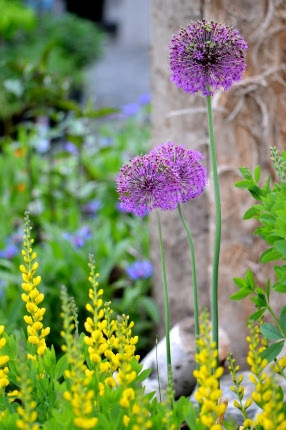 Instead, feed the Alliums with a handful of Pro Gro to keep the leaves green as long as possible and then cut off the stalks and jam them right back into the ground! They will ripen in place and no one will ever know they aren’t attached to the plant. May is gone, June is here and it is one of the prettiest, and busiest, months of the growing season. The pre-Memorial Day urgency is over. We can now just relax and work on our gardens and make them absolutely beautiful and productive. We have been blessed with lots of rain. As uncomfortable as itmay be for parties and picnics, the plants are rejoicing. So KEEP ON PLANTING people. 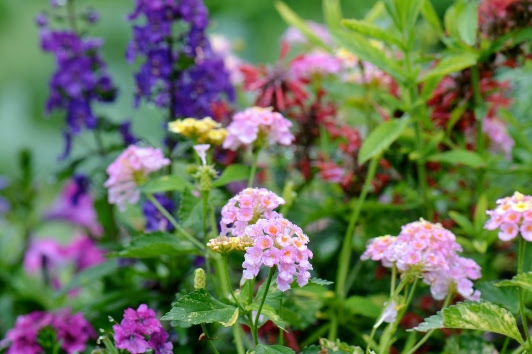 We will do our part by keeping our benches overflowing with all of the plants you know and love and many that you won’t even know that you need until you see them.